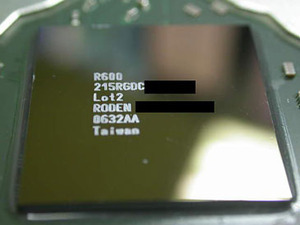 Pictures of what is believed to be AMD's next-generation R600 graphics processor have shown up on Taiwanese forum PCDVD. R600 is the first GPU that ATI will release under AMD's cloak, and will be the company's first DirectX 10 compliant graphics processor. However, specific details relating to the GPU's capabilities are scarce at the moment. 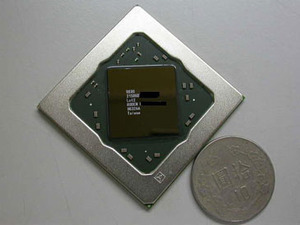 The chip is rumoured to be manufactured on TSMC's 80 nanometre process and according to PCDVD Forums, the chip's surface area is just under 430mm² - that's considerably larger than the company's current high end R580 GPU. Interestingly, the silicon in the leaked pictures has been rotated by 45 degrees. We believe that this has been done in order to incorporate a physical 512-bit memory interface with realistic trace lengths. NVIDIA's first 256-bit dies (NV35 onwards) were rotated by 45 degrees on the chip packaging, so it could be a case of history repeating itself again.